I took a shot at designing my own bag. I used the handle pieces of a McCall's pattern in order to get the right length for the shoulder strap and I just measured up the approximate size I thought I would like. I added some pockets and lining too. I used it over the weekend to carry my camera and GPS on our trip to Cincinnati and I discovered I didn't quite like the size. I loved the strap, it was just right. And the tie is cool since it could be adjusted shorter as necessary but I liked it long. The bag part was a little too shallow for me. I need it to be deeper. So I will try again. I do like the cute fabric. My cousin lives in Mason, Ohio which is a 5-hour drive from my house. Her son and his wife are expecting their first baby and we received an invitation to their baby shower. It may seem strange to go so far for a baby shower however, my cousin is hosting it at her house as a BBQ, Beer & Baby event. Now doesn't that sound like much more fun than just a baby shower? Both my husband and I received an invitation so it sounded like fun and more like a mini-reunion with my uncle, aunt, and other cousins. 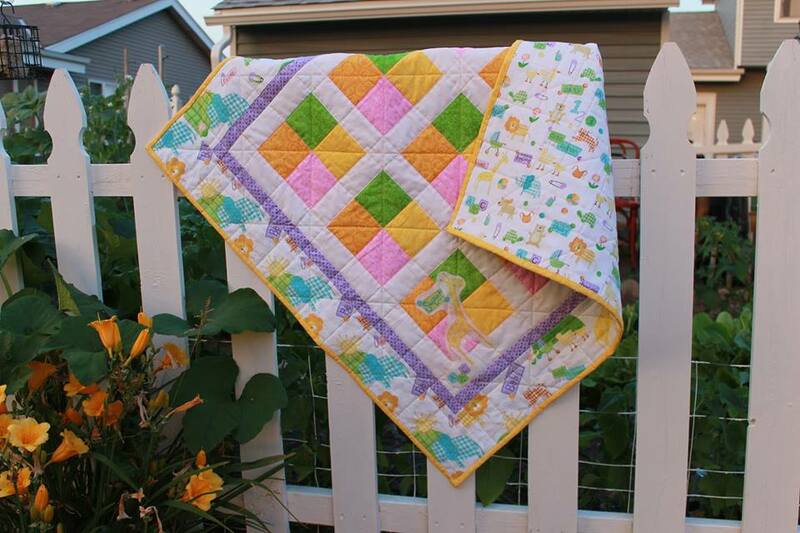 Of course a baby shower for me means a new quilt. I was thrilled with the idea that I could use up some of the fabric I already have so I quickly made up this four-patch simple quilt with bright and cute baby prints. 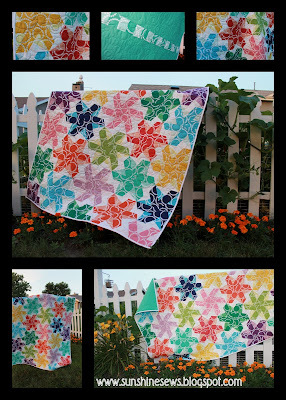 I finished the Bloom Bloom Pow quilt today. I sent it out to be quilted. Renee at Quilting Innovations did the work for me. She has a full time job and quilts in her spare time so between that and my schedule, it was a month from dropping it off to picking it up. Not that is mattered to me, I would never want to rush such excellence. I made the bias binding from Kona white. I did not want the binding to be noticeable. Of course, that would be tough on this quilt. I love the back, the solid color is a great canvas for the quilted circles. 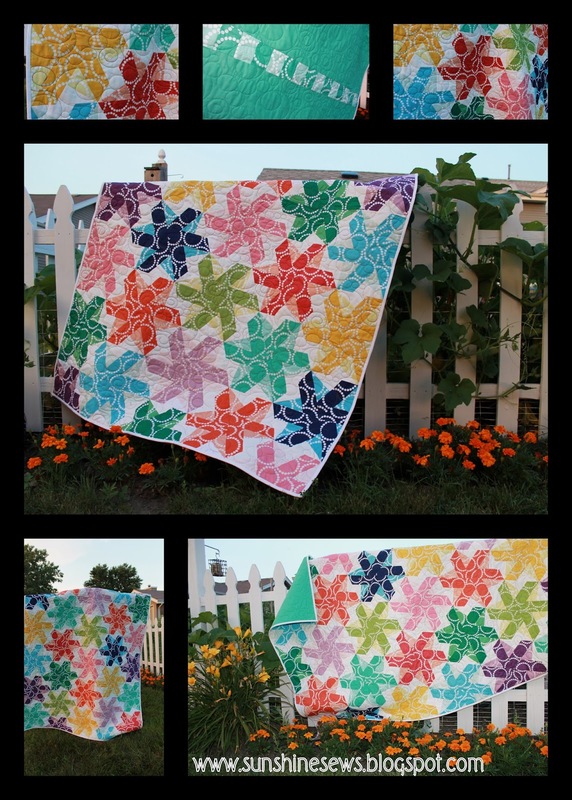 I am so glad it's finished and I really enjoyed the quilt along hosted by Lee at Freshly Pieced which is where I got the instructions for making this quilt. 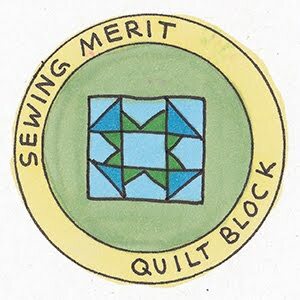 I went to the local Quilts for Kids chapter meeting yesterday. When I got there, the group leader, Renee mentioned that she received a donation of lots of fabric and it was in her garage. She offered it up to us to take but preferred if we did not use it for any QfK quilts. The problem with it was that it came from the home of an obvious chain smoker. The fabric was marred with yellow streaks on the folds and around the edges. The nicotine stains were terribly noticeable and the smell of it was terrible. The stuff wreaked. Even touching it was hard to do, the scent felt like it was being transferred right into my skin. The story about the owner of this fabric is that she went blind so she could not sew anymore. It was very generous of her to give all the fabric away but because of its condition we weren't going to use it on quilts for ill children. It was probably a good decision however, it would be tragic to let it go to waste. So Renee offered it up to the volunteers for our use at our discretion. Another quilter and I started going through the piles and piles of fabric. There were about 10 large bags of fabric, and 2 large bins. There were bags of pillow forms, batting, interfacing, thread and miscellaneous tools for sewing. We each started at the opposite ends of the table and pulled out everything we wanted, switching places when we met in the middle of the table. There were some beautiful fabrics, Christmas fabrics, fall fabrics, quality cotton quilting fabrics, solids, fabrics with pretty flower prints. It was quite a collection. When I got home, I just dumped the two giant bags of fabric I took onto the deck so the fresh air could get at it. With the windows of the house open, my husband pretty quickly complained about the smell coming into the windows. He was disgusted with the smell. So I quickly googled how to get the smoke smell out of fabric and found so many ideas. Since I had so much fabric, my husband got out one of his 40-gallon garbage cans and cleaned it out. I poured a gallon of vinegar into the barrel and added water. I unfolded all the fabric and stuck it in the barrel. I had such a hard time getting past the smell. Every once in a while I went outside with rubber gloves on and stirred the fabric. I figured letting it sit in the sun all day soaking might remove the smell. After about 6 hours of soaking I started to wring out the fabric. There was so much of it. I had 5 or 6 pieces that were 5-yard cuts. Some were 2-yard cuts and the rest were either half yard or 1-yard cuts. It was a horrible process. Once I filled up a clothes basket with wet fabric I left the rest in the barrel. I started up the wash machine with 1/3 of the entire bunch of fabric. I realized that the water in the barrel was so laden with nicotine, it was brown with sludge-like goo at the bottom of the barrel. I had to get the rest of the fabric out of that barrel. So I wrung it all out into 2 more clothes baskets to prep for washing. The whole process seemed so disgusting I was wondering it it was worth it. When the first load of wash was done I quickly started the second basket of fabric. I couldn't wait to take the first load out of the dryer to see if it worked. As I started to fold the pieces of now dry fabric, I was so thrilled that I totally got the smell out. So I folded it all into a nice neat pile. As I got to the last piece, I could see the nicotine marks across some of it. I wasn't surprised and figured that I could cut around it. At that moment, I had a realization. I became overcome with this sadness because here I was going through this person's fabric with disdain forgetting that this was someone's total collection of fabric. Someone had to give up sewing. Someone who was passionate about fabric, as I could tell by all this beautiful fabric. 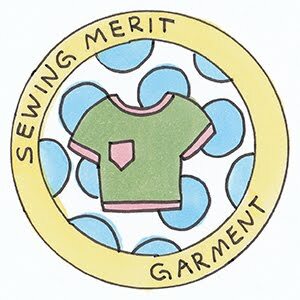 I could not imagine what it must feel like to have to stop sewing and just give away all my collection. I wanted to cry. And I felt guilty for dismissing her and feeling so inconvenienced by the cleaning process. I should be grateful not annoyed. I will cherish this most generous gift that she had given. 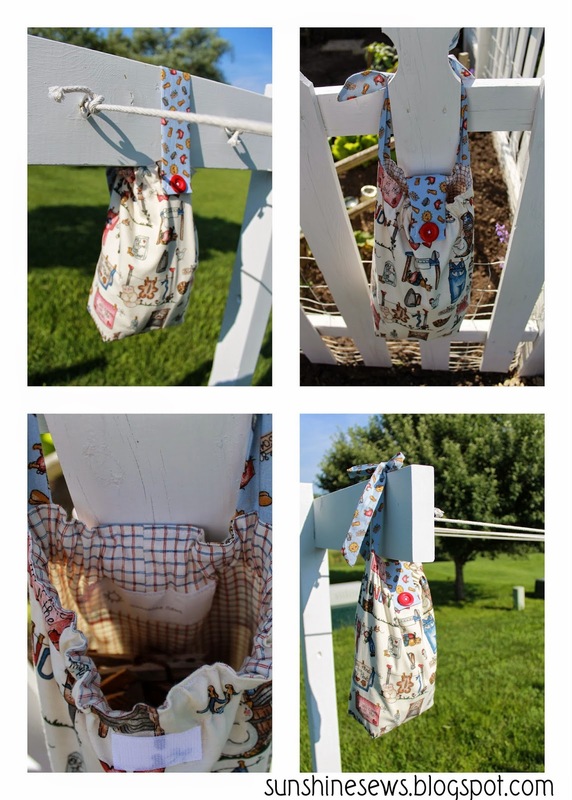 I found this adorable vintage fabric and I thought it would make a cute clothespin bag. 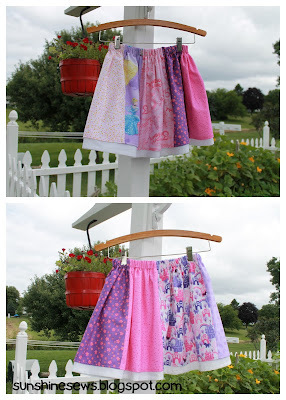 This photo shows a lot more fabric than necessary, but I will break it down to what you really need to make this. Three fat quarters of complementary fabrics. A 14-inch piece of 3/4" wide elastic. A 13" x 6" piece of heavy-weight iron-on stabilizer. A small piece of hook and loop tape (aka Velcro). I used 1 1/2". 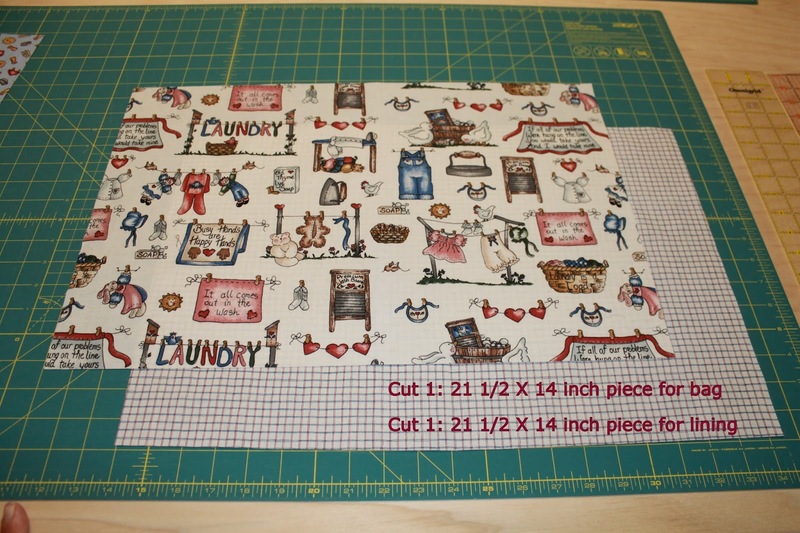 Starting with the main fabric, cut 1 piece, 21 1/2" wide by 14" long. 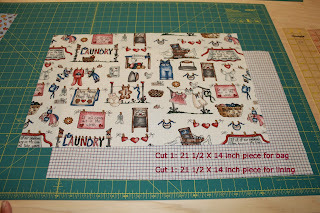 Using a second fabric for the lining, cut 1 piece, 21 1/2" wide by 14" long. Ties: Cut 2 pieces, 21" x 3"
Button Flap*: Cut 1 piece, 13: x 5"
Bag Bottom and Bag Bottom Lining: Cut 2 pieces, 4" x 7"
Fold the main fabric in half, right sides together, lining up the 14" sides. 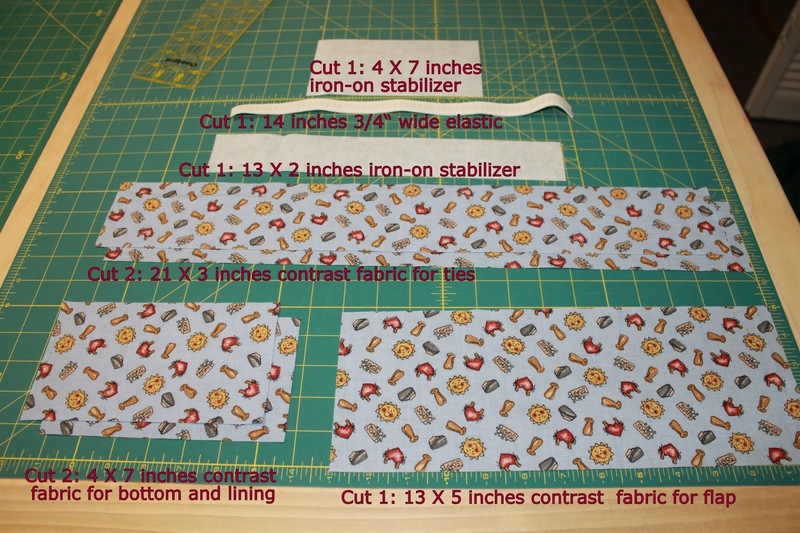 Sew along the edge with a 1/2-inch seam allowance. Repeat Step 1 using the lining piece. Mark the center of the bottom piece on the 7" side. 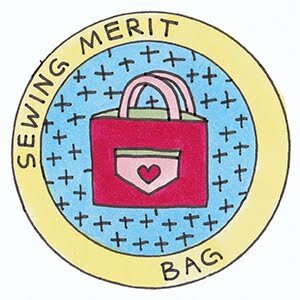 Line up the mark with the center of the seam of the main bag piece. Pin in place, right sides together, easing in the corners. Sew the bottom to the main bag using the 1/2" seam allowance. Clip the corners. Following manufacturer's instructions, fuse the 4" x 7" piece of stabilizer to the wrong side of the lining bottom piece. Mark the center of the fused piece. 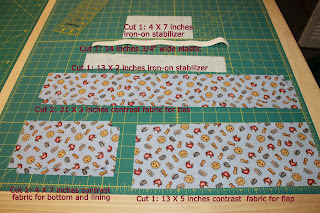 Repeat Steps 5 and 6 using the lining piece and the stabilized bottom piece. Fuse the 2" x 13" piece of stabilizer to the wrong side of the button flap, placing it 1/2" away from one of the edges of the fabric (this will allow the stabilizer to sit inside of your seam when it is sewn). Fold the button flap piece, in half right sides together so you have a 13" x 2 1/2" piece. Sew a 1/2" seam allowance on the long edge and one of the ends. Clip the corners and turn right-side out. Do not worry about finishing off the open edge, it will be sewn in-between the main bag and the lining. Fold the tie pieces in half, lengthwise and sew a 1/4" seam allowance down the long edge stopping 1-inch from the bottom. 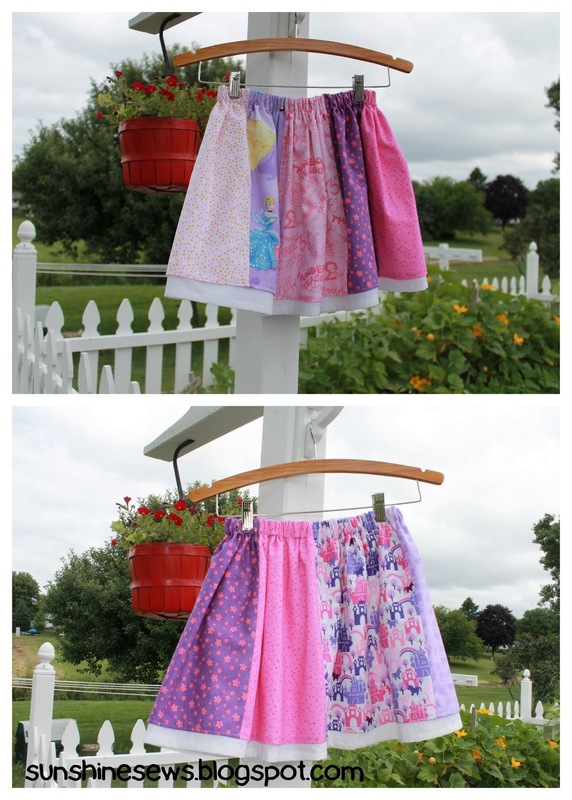 With the needle down, turn the fabric on a 45-degree angle and sew to the opposite corner. Turn the ties right-side out and press. Do not worry about finish off the open edge, it will be sewn in-between the main bag and the lining. Lie the bag flat, with the seam facing up. Pin the flap in the center of the seam. Place the ties 2-inches to the outside of the flap and pin to the to.p of the bag. Baste the ties and flap to the bag. Insert the bag inside the lining, right sides together. Make sure the ties and flap are totally inside the bag. Pin the edges together. Sew using a 1/2" seam allowance and leaving a 2-inch opening. Turn the bag right-sides out through the opening. Press out some of the wrinkles for pulling it through that little hole. Push the lining inside the main bag making sure everything lines up nicely. Press a nice crisp edge on the top of the bag. Mark the bag 1-inch from the top all around the bag. Stitch along the mark forming the bottom of the casing that will hold the elastic. Using the opening from turning the bag right-side out, insert the elastic and stitch the ends of it together. Sew another row of stitching 1/4" from the top of the bag which will give the casing a nice finished look and close the opening all at the same time. Attach one side of the hook and loop tape to the underside of the flap piece. Attach the other side of the hook and loop tape to the center of the body of the bag right under the elastic casing. Hand-sew the button onto the flap. And there you have it...your own homemade clothespin bag. * The size of the flap was determined by the size of my clothesline posts. You could make it a lot shorter if you just wanted it to be a bag closure. If so, I would cut that piece approximately 7" x 5". This is my old clothespin bag. It's in very rough shape. I've abused it by leaving it out in the rain, allowing the grommets to rust and as it became torn from the weight of too many clothespins in it and my frustration with the too small opening, it has lots of rips and frays on it. So I decided it's time to make a new one. Before making one, I thought I would peruse the usual places like Google Images, Pinterest and Etsy (my top three places for inspiration) to see what could be found. I noticed a definite trend in using a hanger to make a bag. They were very cute but not what I wanted. Which brought me to the very question...what did I want? I needed a bag that had a large enough opening so when I stuck my hand in, I could pull out a handful of pins, not just one or two at a time. I wanted it to hang over my freshly updated clothes posts (thanks to my wonderful husband's handywork), not on the clotheslines where it would make the ropes sag. I also wanted it to have ties to tie it to a basket so it stood up, not flop over. So after researching bags, I came up with this. It is inspired by a tutorial I found online from 2 Little Hooligans and you can find her instructions here. I liked her bag a lot. However, I needed mine to be sturdy and a little larger so I added an inch or so, put in some stabilizer and lined it. I also took out the drawstring ties and added elastic instead. I did not want to deal with opening it up every time I wanted to use it. So here is my version of her bag. While making it, I took photos all along the way. I want to turn it into a tutorial of my own, just for the practice in making them. I've always wanted to try my hand at it. I just hope she won't mind. So here is the link to my first crack at a tutorial. I hope you like it. 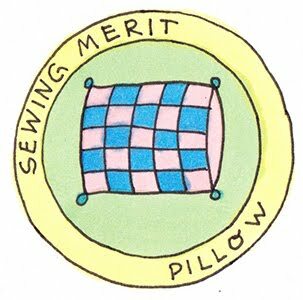 On a separate note, Pat Sloan is doing a challenge over on her blog to sew something every day. 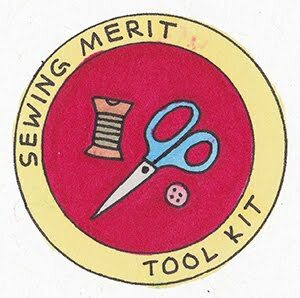 So I think this qualifies as sewing something for the first day of July (we well see if we can meet the challenge again tomorrow). Here is a link to her page where she talks about it.